Apple laptops are slim, whether MacBook Pro, MacBook Air or simply MacBook. But the largest display any of these offer is 15 inches, and most are smaller. Any extra screen space is welcome. That’s where Astro HQ’s Luna Display comes in. It enables your iPad to nearly double the space you have to work with by functioning as a second display for your macOS laptop. This is all the hardware required for Luna Display. There are all-software methods to accomplish this, but many of these still require that the tablet and MacBook have a USB connection. 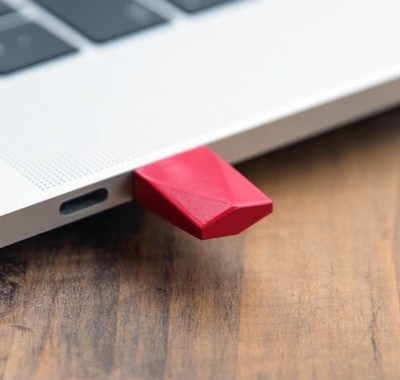 Astro HQ’s solution is a tiny adapter that connects to the laptop’s video port, with no wires necessary. There’s a USB-C version for newer Macs, and a Mini DisplayPort version for older models. Be sure the get the version that’s right for your computer. The Luna Display hardware is really tiny: about the size of the end of your pinky finger. It’s bright red, possible to make it harder to lose. As we mentioned, no wires are required. This accessory gets its power from the port it connects to. You can connect the iPad and the Mac together via Lightning or USB-C if a Wi-Fi network isn’t available, but this is completely optional. A macOS and an iOS application have to be installed, though. Both are very simple to use, with some basic settings to facilitate the wireless connection. This add-on works with macOS 10.11 El Capitan or later, and iOS 9.1 or later. Astro HQ recommends the Mac be from 2012 or newer, but just about any iPad will do. We ran our tests with a 2012 MacBook Air and a 2018 iPad Pro. There is no Windows version of the software. It’s Mac only. To start screen sharing, connect the Mac and the iPad to the same Wi-Fi network. Next, plug the Luna Display into the Mac then run the macOS and iOS apps. The connection happens automatically. There’s just the tiniest hint of latency when playing video, so that the audio is just a hair ahead of what’s on the screen. That said, Luna Display’s performance is far better than that of any software we’ve used that turns an iPad into a second MacBook screen without any wires needed. The slight delay has no effect on non-video uses. We didn’t notice it when word processing, working with spreadsheets, accessing web sites, and similar tasks. Luna Display is very convenient when working with complex spreadsheets. The Luna Display macOS app makes it easy to configure the second screen so it corresponds to which side of the MacBook the iPad is sitting. Or you can go into the operating system’s Display settings to do the same. The iPad’s touchscreen works if you don’t want to use the Mac’s mouse/trackpad. It’s almost like the touchscreen MacBook of your dreams. An Apple Pencil makes a good pointer, but pressure sensitivity isn’t supported. That requires Astro HQ’s Astropad, a separate application designed to let an iPad function as a drawing tool for the Mac. Luna Display alone is not well suited for this. You can connect an external keyboard to the tablet and type on that. This allows you to use the iPad at a distance from the Mac. Astro HQ even raised the possibility of making your iPad the primary screen and keyboard for your Mac mini. You can easily switch back and forth between iOS and macOS apps, but Luna Display will disconnect if left running in the background for more than a few seconds. It’s not possible to transfer text between the two computers via a simple cut-and-paste. Astro HQ Luna Display is the best solution we’ve found for using an iPad as a second screen for a Mac. Images appear on the tablet’s screen very nearly as fast as they would on a standard external display. But the difference between “very nearly as fast” and “just as fast” keeps this accessory from completely replacing a regular external screen that’s hooked to your Mac. In other words, Luna Display is hugely convenient when using a Mac on the go. But it’s not going to replace an external monitor for daily office use. Still, it’s a fantastic addition for people who already travel with a MacBook and iPad. Luna DIsplay is great for people who travel with a Mac and an iPad. This accessory is $79.99, though it’s currently available at 20 percent off. That makes it significantly pricier than rivals like Duet Display, which is $19.99. Luna Display’s advantage over those is that is offers comparable speed without requiring a wired connection. Other wireless solutions we’ve tried have noticeable latency.